Through our robust technology and unparalleled market density, SMS Assist will standardize and simplify your approach to facilities management across your portfolio. The result? Your store managers can focus on your customers’ experience. 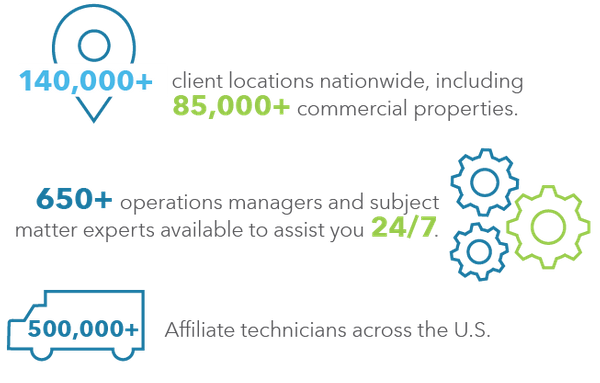 Our fully managed maintenance solution takes advantage of our network of 20,000 Affiliates and market density to deliver the best service at the lowest price. The SMS platform was developed with your enterprise in mind. Your customized dashboard leverages real-time data analytics to provide business decision support. Our operations team manages all maintenance requests through our technology, freeing up your internal teams to focus on strategic projects, such as CAPEX and asset management. A small box retailer with over 8,000 stores across the country. Prior to SMS, the client used a traditional, internal process to manage their facilities maintenance. While this system allowed some visibility into their facilities operation, it required a great deal of time and effort to manage and failed to provide transparency and insight into their maintenance costs. SMS Assist’s processes and buying power efficiencies delivered significant savings in the first year alone. Our fully managed maintenance solution simplified the client’s facilities program for stakeholders at every level of the enterprise. The client also gained access to actionable data, empowering their internal teams to make smarter, more strategic business decisions. "After the implementation of the SMS platform and maintenance solution, we’ve experienced many improvements and efficiencies across our business. From the integrated technology platform to the operational call center and vendor management teams, the entire SMS solution has allowed us to rapidly drive down our total costs of ownership ."